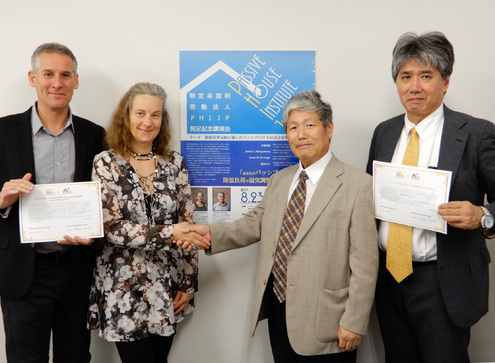 Chicago, IL — October 19, 2017 — The Passive House Institute US (PHIUS) announced Thursday that it officially signed a partnership agreement with the recently founded Passive House Institute Japan (PHIJP) based in Tokyo, Japan. The agreement was signed following the 12th Annual North American Passive House Conference in Seattle where a delegation of six PHIJP board members were in attendance. The two parties will work on developing specific cost and climate optimized design targets for passive buildings similar to the PHIUS+2015 Passive Building Standards for North America as well as making PHIUS Certified Passive House Consultant (CPHC®) training and building certifications available to interested professionals and parties in Japan. The partnership is a result of two first successful projects in the region: In 2016 the first PHIUS+2015 project was certified in Yokohama, Japan. A second project is currently under construction in Chiba, Japan. Japan’s climate zones are very similar to the Eastern half of the United States and range from very cold to very hot and humid climate zones. PHIUS climate specific passive building standards are highly relevant to the climates of Japan, making PHIUS the perfect partner to assist in successful implementation of passive building principles and standards in the varied climates of Japan. PHIUS and PHIJP have already begun work on translating training materials and on generating appropriate climate data. The first professional training is intended to be held in Tokyo during the first quarter of 2018. Copyright © PHIJP. All Rights Reserved.